Holmgren, Eric J.. "High River". The Canadian Encyclopedia, 11 May 2016, Historica Canada. 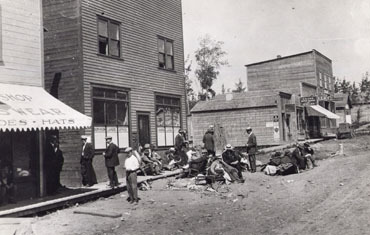 https://www.thecanadianencyclopedia.ca/en/article/high-river. Accessed 18 April 2019. High River, Alta, incorporated as a town in 1906, population 12 920 (2011c), 10 716 (2006c). The Town of High River is located 55 km south of Calgary, and was named for the nearby Highwood River, known to the BLACKFOOT as ispitsi, "tall trees. High River, Alta, incorporated as a town in 1906, population 12 920 (2011c), 10 716 (2006c). 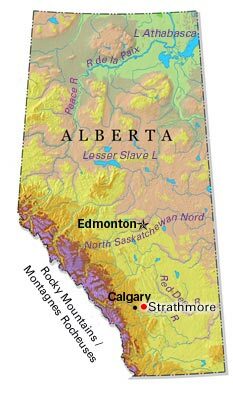 The Town of High River is located 55 km south of Calgary, and was named for the nearby Highwood River, known to the BLACKFOOT as ispitsi, "tall trees." Traces of Blackfoot hunting villages have been found throughout the area, which was opened to ranching in the 1880s. In 1892 the CPR arrived in High River and it became an important shipping point for cattle. Today ranching and wheat growing are the mainstays of the local economy. 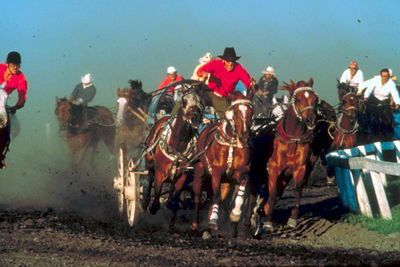 The ranching past and the life of the homesteaders is preserved in the Museum of the Highwood. W.O. MITCHELL set the scene of many of his stories in the area. The town is the birthplace of Rt Hon Joseph CLARK, prime minister of Canada 1979-80. High River, Alberta (Corel Professional Photos).